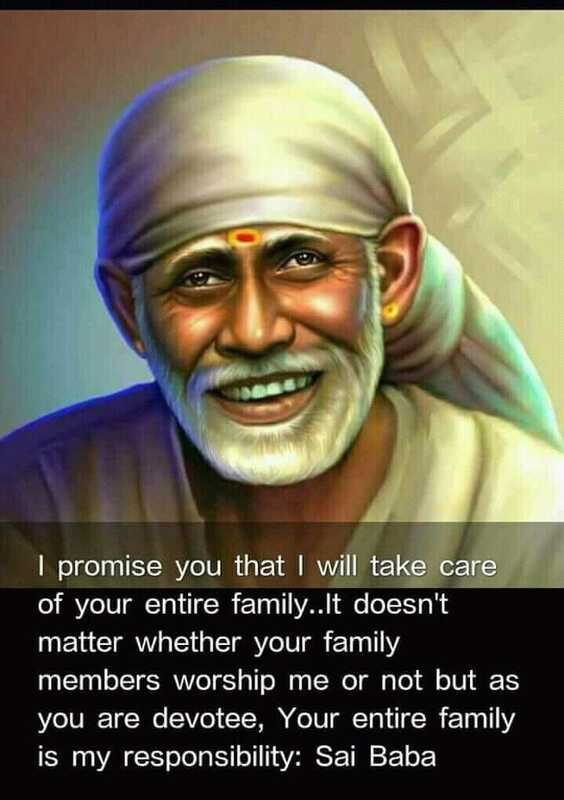 Anonymous devotee of Shirdi Sai Baba from USA says : Sairam to all my Sai family members. This is a anonymous devotee from USA. My daughter and I always ask Baba before making some decisions. My daughter wanted to join Wrestling team at her school but I was hesitant because of the nature of the sport. When we asked Baba He hinted us to join the wrestling team. So she joined the team and everything went well almost till the end of the wrestling season where she had collarbone fracture 2 days before the end of the season during wrestling practice. The doctor said that surgery was not needed and put her on a sling and told her not to do any sports and physical exercise for about 2 months. Baba hinted us to start sports in 2 weeks. I prayed to Baba telling that Your Udi water is the only medicine and heal her collarbone and I gave her Udi water 3 times a day. Anonymous Shirdi Sai Devotee from India says : Om Sai Ram! I have penned down an experience soon after we enrolled for Mahaparayanam. You may share it if you find it worthy. I consider myself just as a humble devotee of Sai. I had read and heard of miracles happening to others but had never experienced one myself. Or should I say I had failed to identify those blessing moments in my life. 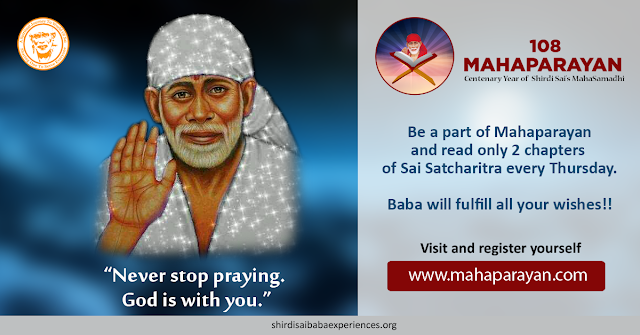 I share with you all an experience that reiterated my faith in Baba and I realised that my merciful Sai is always by my side and that of my family. This incident happened soon after we enrolled for Mahaparayanam. 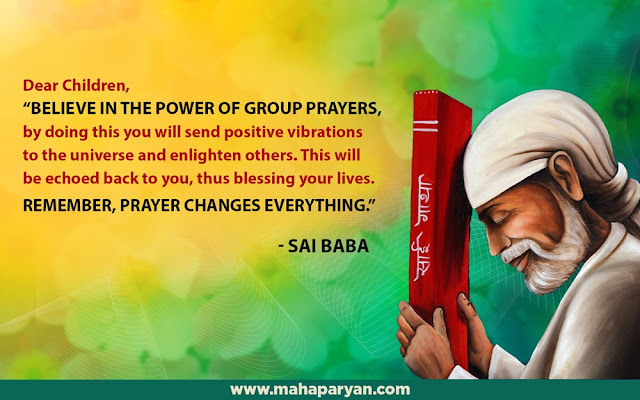 Shirdi Sai Devotee Anita Ghorpade from India says : I would like to share my experience with our Mahaparayan group. A stray dog used to sit in front of my house daily and every morning I used give him food. Gradually I was too much attached to it. It used to run along with our car till the end of our road and used to come running in the evening on our return from office. Suddenly it was missing from two days and then I was told that the corporation people had taken the dog. Shirdi Sai Devotee Sheeja Delish from Dubai says : Om Sai Ram Myself Sheeja Delish in Mahaparayan group of Dubai under Lataji. There happened many Miracles in my life after surrendering myself to Baba but now I want to tell you something which happened after I started Mahaparayan last Thursday. In my house except me no one else pray to Sai but I am fully devoted to Him. It was a Miracle for me to join in this Group. Sai Ram made it happen, He included me into this group that was a great Miracle which I will tell later. Shirdi Sai Devotee Isha Shruti from India says : One Thursday there was my exam and I reached home at 6 pm and was very much tired . It is a rule that we have to complete our paath (chapter allocated for MP raeding) till 7:30pm to that it helps the tracking to volunteers, but I was so much tired so I slept and forgot about the paath. Somehow I woke up before 7:30 and then after seeing whatsapp messages I realised that I had not completed my paath. I was very much worried and really not feeling well, so I requested in other groups asked that anyone could do the paath of Satcharitra on my behalf(I forget chapter no.). Now one of Baba's devotee got ready and she read on my behalf before 7:30 pm ie (In between 7 to 7:30)and then I reported my completion in parayan group. Shirdi Sai Devotee Neetuji from India says : Om Sai Ram, I am Baba's devotee since so many years. Recently I joined VSP(Vishnu Sahastranaam Parayan) group. After that I got to know about Mahaparayan. It was late to join because it hads been started in 2017 and now it was March 2018. I asked to 2 or 3 devotees that shall I join this MP group but there were no vacant seats as all classes are full. Then I prayed to Baba to please give me assurance that soon I would become a member of MP group. Shirdi Sai Devotee Laxmi Kolli Says :Om Sairam. Starting 2018 I decided to do Vishnu Sahastranamam once a week not deciding the day for it to be done (Monday, Thursday or Saturday). I couldn't do it on Monday or Thursday of that week and went to Baba’s temple here on Saturday totally forgetting about Vishnu Sahastranamam. It was around 8:40am I remembered about Vishnu Sahastranamam in the temple. I carry Vishnu Sahastranamam small book in my purse and I had totally forgot about it and now there was no time for me to listen on Youtube also as usually temple priests start aarti at 9 am. Anonymous Shirdi Sai Devotee from India says : Sai Ram. My good wishes and prayers for all readers and the admins of this Mahaparayan blog. I am from MP-210 Mahaparayan group. May Baba bless us all with abundance of health and happiness. Let our Devotion and Faith in Baba's Lotus Feet grow manifold. My koti koti Pranaam to Our Guru, Lord Sai Baba, Who is always eager to come to the rescue of His devotees whenever the devotee calls Him with love and faith. Love You, My Sai Maa. Without You and Your Grace, my life would not have been worth living. As I have shared in my last post, our Shirdi trip materialised as soon as I started AASM and MahaParayan. Prior to the trip, I read in a blog that since green is the colour of healing, the Angel of healing appears in that colour. My son had injured his right eye and his vision was blurred. So I requested Baba that when I see Your Aarti online, I want to see You dressed in green, so that I am assured that You are healing my son. Anonymous Devotee Of Shirdi Sai from India says : Om Sai Ram, I want to share with you my experience with Baba after joining Mahaparayan, Naam Jaap and prayers to Baba. Only because of Baba my daughter got placed in a good company for her summer placements after joining Mahaparayan. Baba has performed His Leela as my daughter has got her summer job in a blue Chip company. She was missing out on few offers but our Prayers to Baba have been answered. Baba has not only given her a confidence boost but also helped her financially. Shirdi Sai Devotee Neeta Dembla from India says : Om Sai Ram, I am Ratna/Neeta from MP16 group. I would like to share a biggest miracle of my life after Mahaparayan and it as below. My husband had addiction of alcohol since around 40 years almost, I always wanted him to leave consuming alcohol but somewhere deep inside I knew it was not possible for him to be able to do that, So I left all hopes of it. Shirdi Sai Devotee Nisha Agarwal from India says : Om Sai Ram, I am Nisha Agarwal from red house. I take this opportunity to thank Sai and Mahaparayan and hope this small post may provide hope to many sailing in same boat. I was living in a rented house since I came to Pune. When I started this parayan from September, I have got our own big house to live in and all by His grace. So finally with Baba's blessing we were able to buy or dream house. Thank You So much Baba for Your blessings through Mahaparayan. Anonymous devotee of Shirdi Sai Devotee from India says : I am part of Mahaparayan, Red group of Utkarsh ji. Last year was a topsy turvy situation in my life, the relationship I had for 5 long years ended because the guy couldn't convince his parents and the guy got married to whom his parents selected even though he was not interested [ that is what he claims]. I had several prayers to Shirdi Sainath regarding this relationship to work and had been to Shirdi for this regard for almost 2 times and got some peace and confidence that this might work. So the guy just carried on with his new phase of life, and I was alone facing battles in my mind as to why this didn't work out in spite of faith and patience. Shirdi Sai Devotee Gayathri from India says : Om Sai Ram, my name is Gayathri. I thank you all whosoever involved in making this platform and helping us to share our experiences with others and making us come closer to Baba. May Baba bless you all immensely. I am bound to share so many experiences but these two experiences I want to share now, the rest whenever Baba feels, will share with you all. Please accept my salutations, Baba. Shirdi Sai Devotee Sai Naresh from India says : Om Sai Ram, Me and My wife are part of MP-113 Mahalakshmi Sai group. We are looking to buy a flat/house from past 1 to 2 years and nothing was working out. Baba was testing our patience. And my wish was to have a own house before the 100th Anniversary of our Deva. He knows everything and exactly in 2018 March we got finalized with one. 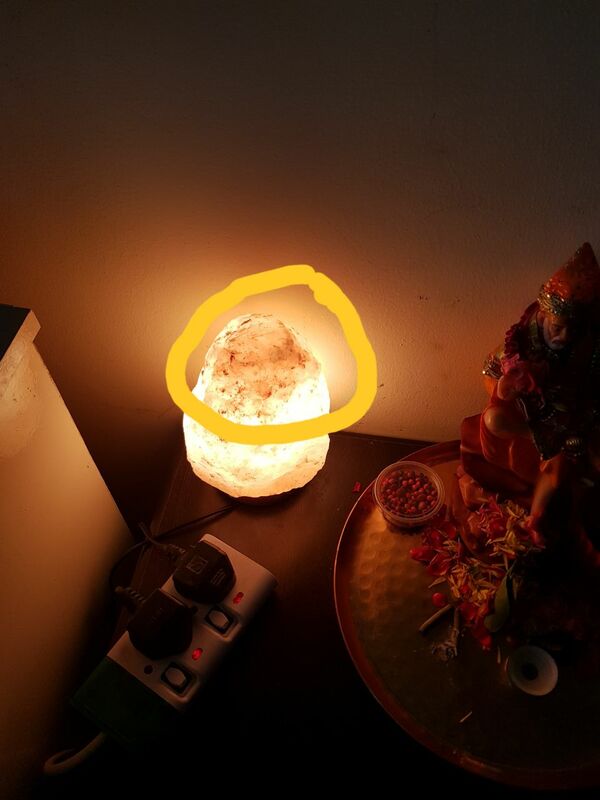 It was 1.5 year old flat in an apartment. Land owners got few flats as their share from the builder. Since the land owner was very badly in need of money, he agreed for the price in our budget. To whomever I said that I was buying in that location for this price everyone was saying it was a best deal that I got. I can say it was best price in that area, with good carpet area size, good lighting and facilities like swimming pool etc. and it was ready to move. In all aspects it was a very best deal. This all happened because of our Sai. Shirdi Sai Devotee Anusha says : Om Sairam! Hello everyone my name is Anusha from India. I want to share my whole heart experience with Baba’s miracle with all. I got married in 2010 November. By Baba’s grace I got a good husband but my fate tested me not once but five times. I got aborted five times till 2016. Everytime when it happened I trusted Him more and more. I consoled myself that Baba was testing my patience i.e, Saburi. 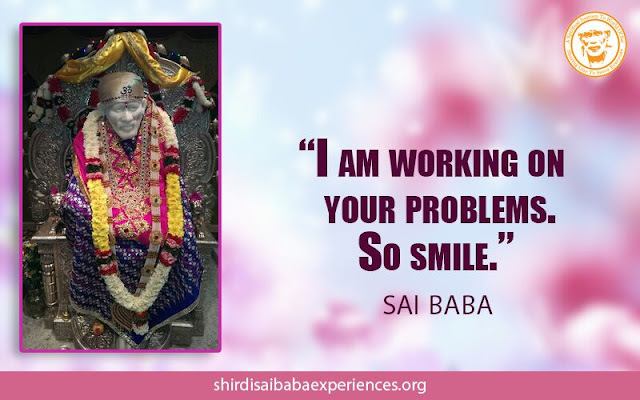 At last when Baba made me to go to Shirdi, I cried like anything before Him and asked Him for a solution. After coming from Shirdi I went to one hospital in Bangalore where I got a solution. Then I got into it and became pregnant with Baba’s guidance. Shirdi Sai Devotee K Pramila says : Om Sai Ram. 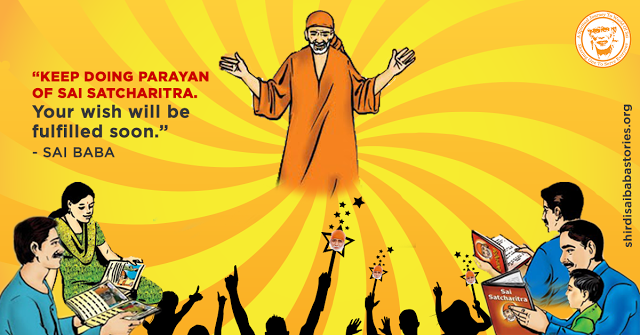 After I started doing Sai Baba Parayan, my critical problem got solved to an extent of 50% and it was unbelievable. I have now got confidence that Babaji will surely soon solve all the problems who have got confidence on Him. Now I'm feeling very much happy than before. Shirdi Sai Devotee Manibala From India says : I am Manibala from MP-142 Group. I had shared some of wonderful experiences before which had happened during Mahaparayan. And now I would like to share another experience with you all. Last Thursday I had received SriPada Swamy Vastram* which is truely a blessing. And today (31st March) early in the morning I got a dream. I went to Shirdi Sai Samadhi temple at 4 am. I was just only few feet distance from Sai Baba moorthy. Sai mangal snaan was been performing by pujaris. After mangal snaan, one of the pujari had sprinkled that water on me. I felt very blessed at that moment. I could experience and feel that bliss even in my dream also. And as soon as mangal snaan was completed, Sai Baba was looking at me with a bright smile. Pujaris started to dress up Baba with a Blue Shawl (Chaaddar). Then they performed aarti to Sai. I had darshan for nearly 30 minutes. They distributed Prasad to some people over there and we came outside the temple. There at the place near Gurusthaan an old man came near to me and gave me a Pure White Chaaddar and said "Are you satisfied with this Sai Shawl or you want another one to give me?". Then holding on that shawl, I began to cry with all happy tears. Then the old man disappeared all of a sudden. With heart filled happiness I was just moving outside from the temple. Then I went to the place where we can see Baba clearly from the left window of the Temple. I was praying there and a young man came to me and gave me another blue coloured Shawl. He blessed me by placing his hand on my head and went. I was so happy at that time. I couldn’t even say a single word by having these two beautiful that too Baba's used shawls with me. Even though it was a dream but I felt really very blessed. Next time when I go to Shirdi I hope this happens in real for me and I wish to get those two shawls in my next Shirdi visit. Because normally whenever I get any dream regarding Sai, very soon it happens in real with me. I wish even this dream also come true soon. 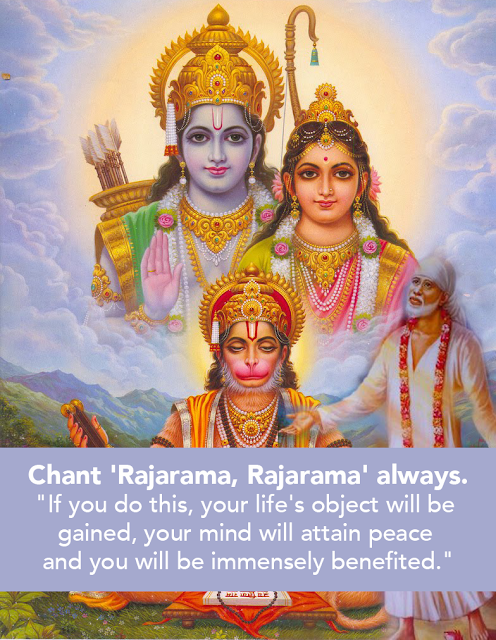 But I am very happy that Baba blessed me with such a wonderful during Mahaparayan. Thank You Sai Baba. Visit to Shirdi is auspicious and equally auspicious is Baba’s visit in our dream. Sometimes we may not immediately understand the meaning but when time comes Baba makes everything very clear; for which we need to have Shraddha and Saburi. Love You Sai. Jai Jai Ho Sai…! Shirdi Sai Devotee Sapna from India says : Om Sai Ram to my Sai family. Inam Sapna from New Delhi. Yesterday I was very upset due to life hurdles. Then I came to know about the group "Sai-Heal-Our-Relationship" group (Where we need to read Sai Kasht Nivaharan mantra to destroy our difficulties and to heal our relationship) and I wanted to join this group. But I joined the group link very late and the seats were only for 108 members based on first come first basis. I was thinking that "Abhi mere kasht nivaran ka time nahi aaya" (Still the time has not come to overcome my difficulties ). "Mere bure karmo ka fal abhi baki hai aur shayad mera nam group main add nahi hoga". (The fruit of my bad karmas are still pending and hence may be my name will not get added in the group).